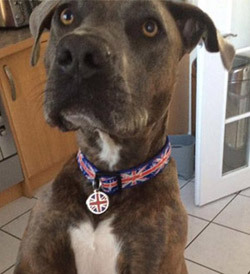 Union Jack dog ID tag, deep engraved by Red Dingo. 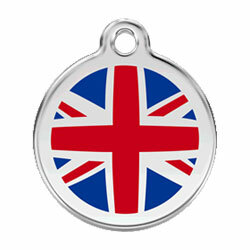 Hard-wearing polished stainless steel dog tag with enamelled design, size Medium 30mm diameter. 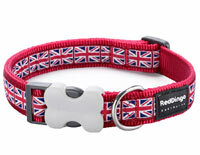 Your dog can be proud to be British with these patriotic Union Jack dog accessories. 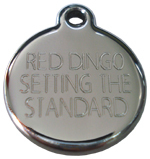 Great looking dog tag, good engraving and arrived on schedule. Brilliant service by D for dog. Excellent name tag and with Union Jack on one side it really stands out. I love these dog tags and have several to match collars that I've bought. Always good quality and the engraving is clear and correct. 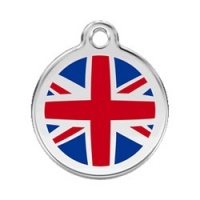 We ordered this dog tag just under 6 months ago, inspired by the olympics for our Springer, who can swim for England! After such a short space of time the coloured strips have come away and it's now just a plain tatty looking dog tag. Such a shame!